Pericardial tamponade is a potentially fatal complication after cardiac surgery. Its incidence ranges from 0.2% among patients undergoing coronary artery bypass graft surgery to 8.4% in heart transplant patients. ,, Clinical and hemodynamic parameters may not be reliable to diagnose the localized tamponade accurately as classic features of generalized pericardial tamponade may be absent in such cases. It requires prompt diagnosis and appropriate management to avoid cardiovascular collapse. Transesophageal echocardiography (TEE) allows a rapid diagnosis and an opportunity to institute appropriate therapeutic measures. , which explained hypotension. Patients' volume status was optimized and positive end expiratory pressure was lowered from 7 cmH2O to 2 cmH2O to favor right sided filling. TEE was performed hourly for initial 4 h to assess the size of the effusion and its hemodynamic impact. Thromboelastogram was performed, which showed normal parameters. Mediastinal chest tubes were repeatedly checked for patency. Hemoglobin and hematocrit evaluation was done regularly. There was no significant drop in hemoglobin level and trend of serum lactate level was not rising. Patient was mechanically ventilated for 12 h post-operatively until hemodynamics was stabilized. Mediastinal chest tube drainage over 12 h was 350 ml. Repeat TEE imaging after 8 h in ME four chamber and bicaval views showed decreased collection (<1 cm) with no significant effect on RA and ventricular filling. The systolic arterial pressure stabilized to 120 mmHg, CVP decreased to 8-10 mmHg, adrenaline infusion decreased to 0.2 μg/kg/min and serum lactate level decreased to 0.8 mmol/L. Thereafter the patient remained stable and was extubated. Patient was discharged on the 7 th post-operative day without any evidence of pericardial effusion on TTE. Most patients with localized pericardial effusion present without classical or echocardiographic signs. Pulsus paradoxus may not be present in patients with isolated right-heart tamponade. Echocardiographically, transmitral and transtricuspidal respiratory flow variations may be absent because of the constantly raised left ventricular filling pressure. 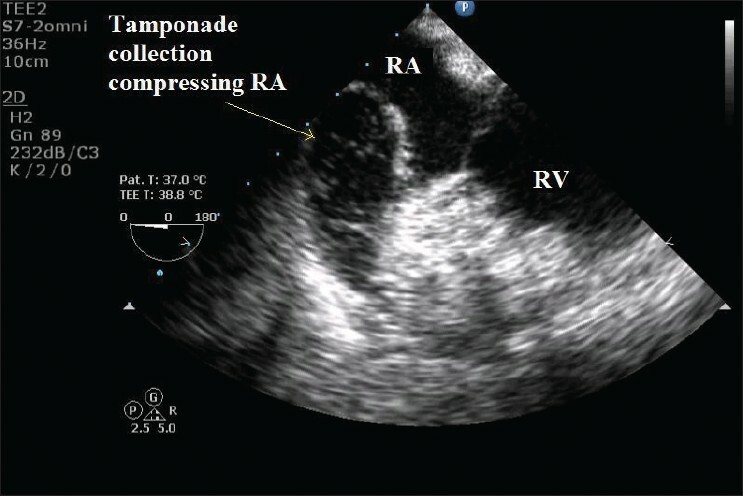 Localized right-heart tamponade has been characterized by elevation of RA pressure more than pulmonary capillary wedge pressure, along with the signs mimicking right ventricular dysfunction such as prominent neck veins, low cardiac output and low blood pressure. In the present case, CVP was not very high despite localized tamponade compressing RA. It may be due to increased venous compliance. Filling pressure may not be always correct in reflecting volume status of the patient. Such altered relationship between pressure and volume can make the evaluation of such patients difficult. The TTE may not be conclusive in the post-operative period due to positive pressure ventilation, chest tubes and supine position. Visualization of all cardiac chambers may not be possible with TTE and generally, the apical position is the only available window. In the present case, TTE was not able to detect localized effusion along the free wall of RA due to its distant location in the far field of the acoustic window. Other hemodynamic monitors like Swan-Ganz catheter More Details and derived parameters can only suggest low cardiac output state, but may not be able to give the diagnosis of cardiac tamponade. It has been emphasized repeatedly that TEE provides more accurate and precise diagnosis in cardiac surgical patients. , TEE is an invaluable tool in diagnosing the cause of hemodynamic instability in critically ill patients,  especially after cardiac surgery , Echocardiography is safe and effective to detect rapidly developing pericardial effusion after cardiac surgery. Though the pericardium may be left open following surgery, acute accumulation of only a moderate amount of blood can readily cause cardiac tamponade in a post-operative patient. Right ventricular diastolic collapse is important echocardiographic sign of tamponade in the presence of circumferential effusion. However, when the effusion is loculated or right-sided pressures are elevated, this sign may be absent. Cardiac tamponade with hemodynamic compromise is a surgical emergency and needs immediate re-opening. Removal of accumulated pericardial fluid commonly produces significant hemodynamic improvement because of the steep pericardial pressure volume relationship. Hoit and Fowler  and Little and Freeman,  recommended drainage if the effusion is more than 20 mm and if there is collapse of the right chambers on ultrasound or if the duration has been less than 1 month, given the high risk for the development of tamponade. , These criteria can be applied to post-operative cardiac patients. In the present case, despite evidence of localized tamponade, a wait and watch policy was successfully employed rather than re-exploring the patient immediately. We suggest that if hemodynamics is maintained and there is no fall in hematocrit and there is an absence of increase in effusion echocardiographically, then localized tamponade can be managed conservatively without re-exploring the patient. In such scenario, TEE may play an important role in monitoring cardiovascular hemodynamics. However, in hemodynamically compromised patients such localized compression need be drained to achieve early hemodynamic stability. 1. Chuttani K, Tischler MD, Pandian NG, Lee RT, Mohanty PK. Diagnosis of cardiac tamponade after cardiac surgery: Relative value of clinical, echocardiographic, and hemodynamic signs. Am Heart J 1994;127:913-8. 2. Bateman T, Gray R, Chaux A, Lee M, De Robertis M, Berman D, et al. Right atrial tamponade complicating cardiac operation: Clinical, hemodynamic, and scintigraphic correlates. J Thorac Cardiovasc Surg 1982;84:413-9. 3. Pinsky MR. Clinical significance of pulmonary artery occlusion pressure. Intensive Care Med 2003;29:175-8. 4. Reddy PS, Curtiss EI, O'Toole JD, Shaver JA. Cardiac tamponade: Hemodynamic observations in man. Circulation 1978;58:265-72. 5. Costachescu T, Denault A, Guimond JG, Couture P, Carignan S, Sheridan P, et al. The hemodynamically unstable patient in the intensive care unit: Hemodynamic vs. transesophageal echocardiographic monitoring. Crit Care Med 2002;30:1214-23. 6. Wake PJ, Ali M, Carroll J, Siu SC, Cheng DC. Clinical and echocardiographic diagnoses disagree in patients with unexplained hemodynamic instability after cardiac surgery. Can J Anaesth 2001;48:778-83. 7. Colreavy FB, Donovan K, Lee KY, Weekes J. Transesophageal echocardiography in critically ill patients. Crit Care Med 2002;30:989-96. 8. Poelaert JI, Trouerbach J, De Buyzere M, Everaert J, Colardyn FA. 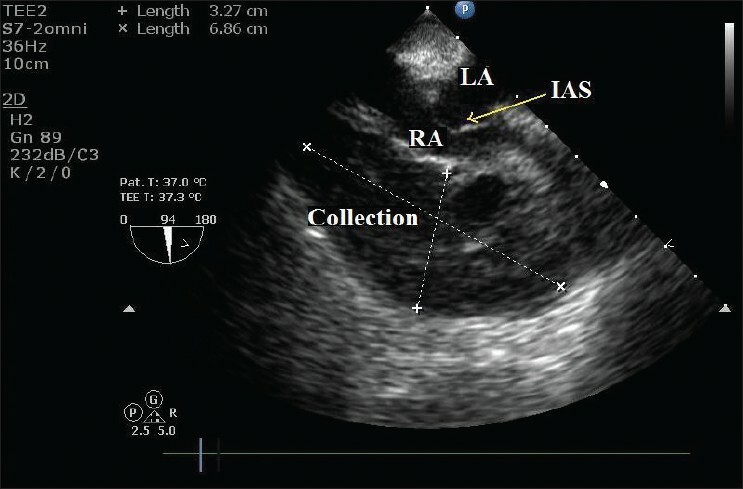 Evaluation of transesophageal echocardiography as a diagnostic and therapeutic aid in a critical care setting. Chest 1995;107:774-9. 9. Bruch C, Comber M, Schmermund A, Eggebrecht H, Bartel T, Erbel R. Diagnostic usefulness and impact on management of transesophageal echocardiography in surgical intensive care units. Am J Cardiol 2003;91:510-3. 10. D'Cruz IA, Kensey K, Campbell C, Replogle R, Jain M. Two-dimensional echocardiography in cardiac tamponade occurring after cardiac surgery. J Am Coll Cardiol 1985;5:1250-2. 11. Armstrong WF, Schilt BF, Helper DJ, Dillon JC, Feigenbaum H. Diastolic collapse of the right ventricle with cardiac tamponade: An echocardiographic study. Circulation 1982;65:1491-6. 12. Russo AM, O'Connor WH, Waxman HL. Atypical presentations and echocardiographic findings in patients with cardiac tamponade occurring early and late after cardiac surgery. Chest 1993;104:71-8. 13. Tsang TS, Oh JK, Seward JB. Diagnosis and management of cardiac tamponade in the era of echocardiography. Clin Cardiol 1999;22:446-52. 14. O'Connor CJ, Tuman KJ. The intraoperative management of patients with pericardial tamponade. Anesthesiol Clin 2010;28:87-96. 15. Hoit BD, Fowler NO. Influence of acute right ventricular dysfunction on cardiac tamponade. J Am Coll Cardiol 1991;18:1787-93. 16. Little WC, Freeman GL. Pericardial disease. Circulation 2006;113:1622-32. 17. Hoit BD. Management of effusive and constrictive pericardial heart disease. Circulation 2002;105:2939-42.